The endoparasitic thorny-headed worms (1150 species) require two hosts to complete the life cycle. The juveniles are parasitic in crustaceans and insects. Adults live in the digestive tract of vertebrates, especially fish. The body of the adult is elongate and composed of a trunk, a short head region and a proboscis covered with recurved spines with which the worms embed themselves in the host’s gut wall. The proboscis is not used for feeding, only for attachment, since like tapeworms, acanthocephalans have no gut and absorb nutrients directly from the host’s gut through the tegument. Eggs are passed into the environment; they develop further when ingested by the intermediate host. 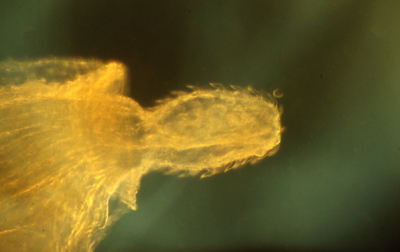 The juvenile acanthor bears an anterior crown of hooks used to penetrate the tissues of the intermediate host, where it undergoes developmental changes to form an infective cystacanth. When the intermediate host is eaten by the definite host, the cystacanth excysts and attaches to the gut wall and develops into an adult. Above right : Polymorphus spp. showing the spiny proboscis that gives acanthocephalans their name. Below right : Profillicolus bolulus in the intestine of the eider duck shows the ‘orchard effect’: spacing of the parasites so that ‘they do not tread on each other’s toes’. Acanthocephalans often exist in great numbers in the vertebrate host and can cause much damage to the gut wall. 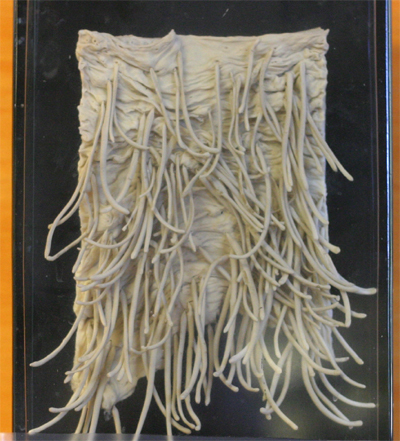 Below: The largest acanthocephalan, Macracanthorhyncus hirudinaceous, causes serious disease in its definitive host, the pig. Beetles act as hosts for the juveniles.